The spin dribble or spin move is a move used by an offensive player to get by a defensive player. 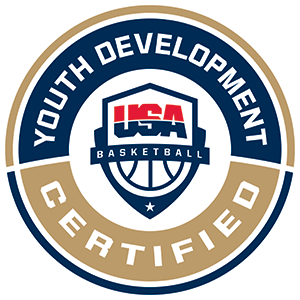 The offensive player will dribble forward, take a hard dribble and spin by turning their back to the defender and keeping their body between the defender and the ball. The offensive player will come all the way around until facing forward again and will now have the ball in their other hand. The players will all have a ball and start on the sideline. 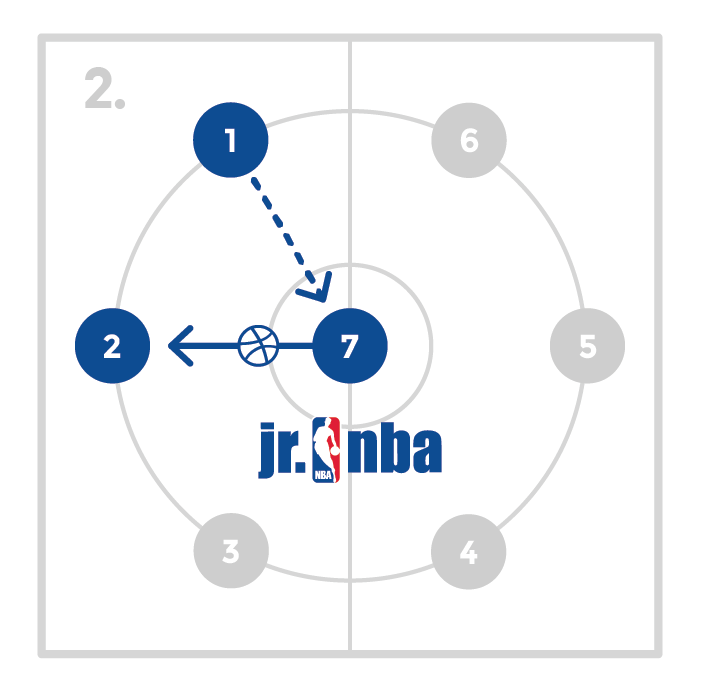 They will take 2 dribbles with their right hand and spin to their left. 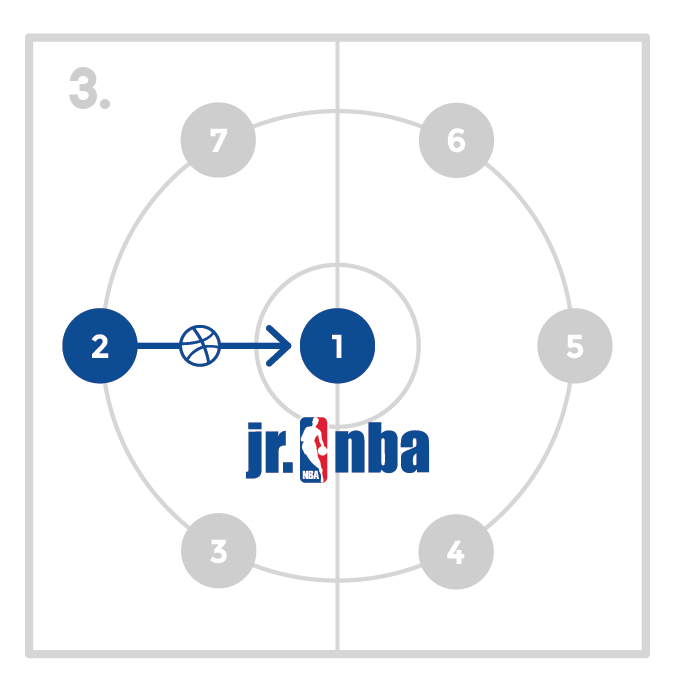 The players will repeat now taking 2 dribbles with their left hand and spinning back to their right. The players will do this all the way down the court and back. 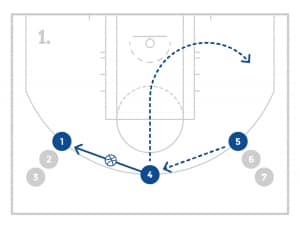 Make sure the 2nd dribble is a hard dribble and the players can think about having their feet almost come to a jump stop at the same time as their 2nd dribble as they prepare to spin. All players should have a basketball and spread out on the court in a designated area. The players who are “it” will dribble around and tag the other players while they are trying to avoid being tagged. When a player is tagged, they have to jump stop and stay in one spot until another teammate unfreezes them. It is the goal of the “it” players to tag as many players as possible in 1 minute. Change who is it and repeat. Work on controlling the ball and executing good jump stops. Remind the players to keep their head up so they don’t run into each other and can avoid being tagged. Players cannot be un-tagged in this game. 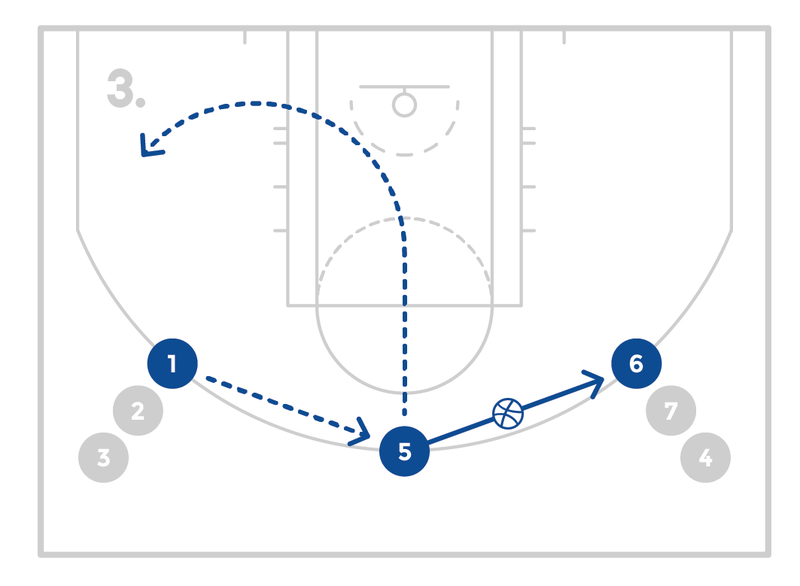 Players will start with the ball in their left hand outside of the tree point line on the right side of the court. 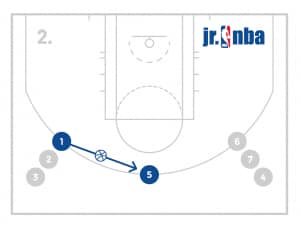 They will dribble while running with there left hand to the cone and then make a crossover dribble and continue in for the lay-up. 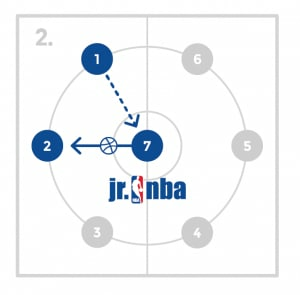 After shooting, the player will get their rebound and dribble in a straight line back to have court with low crossovers. Count how many makes the team gets in those 2 minutes on each side. Work on a low, quick crossover by pushing off the outside foot and exploding towards the basket. Have players partner up in front of a wall. The first player will be in an athletic stance and when the coach says, “shot!” the player will turn and box out on the wall. The players will make sure they make contact turn and box with their elbows and hands up and can then move to jump for the ball. The partner will go next and the process will continue. Make sure the players get comfortable making contact and use perfect box out form. A jab step is an offensive move used by the player with the ball to gain an advantage over the defense. 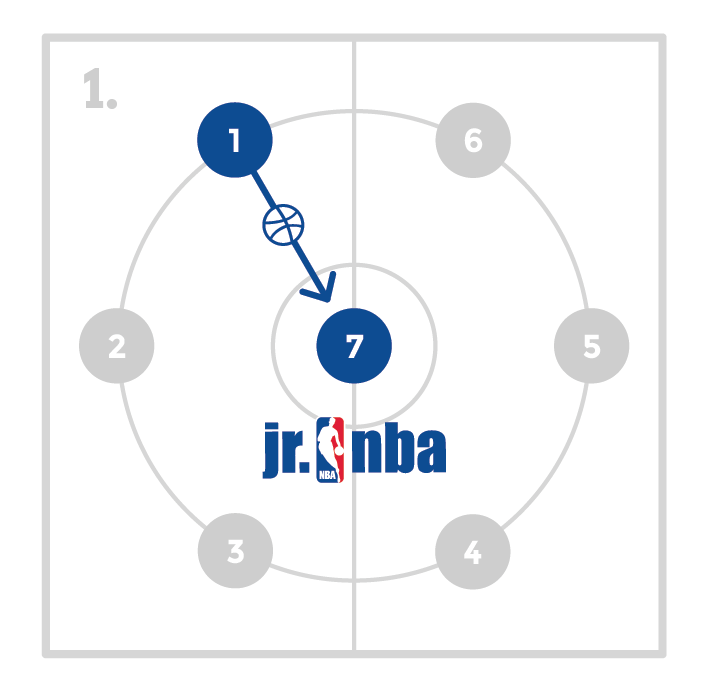 The offensive player will move their foot so that it appears they will go in a particular direction. This fake forces the defensive player to move and respond to the jab step. Once the offensive player recognizes how the defense responds, they can make a move. The traditional jab step occurs before a player dribbles the ball. The player has or will establish a pivot foot that will remain on the floor without moving throughout the jab step. The player will be in a good athletic stance and push off the pivot foot while lifting the other foot and moving it forward to simulate making a move in that direction. It is important that the pivot foot does not move. The player will aggressively place the lifted foot on the floor at a forward angle from where it started. At the same time, the player will swing his or her arms and the ball in the same direction as the jab step in order to make the defender believe the jab. The offensive player should read how the defensive player responds to the jab step to continue their effort to score. All players should have a ball (or share) and line up on the baseline. Have the players start in a good triple threat position. On the coach’s command have the players all jab the same way. Correct any mistakes and also do it from the other foot. Make sure the players jab quickly and aggressively. 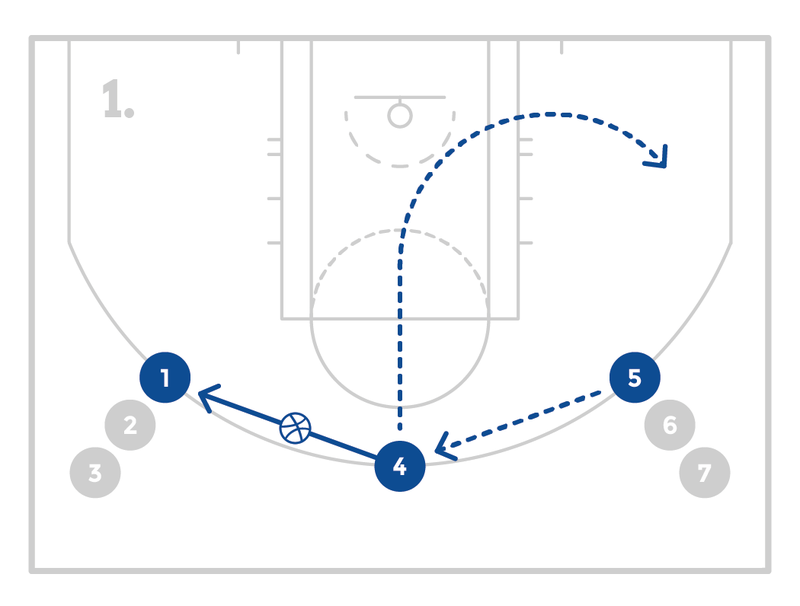 The player should start by facing the basket where ½ court and the sideline meet. The player will jab the foot closest to the sideline. 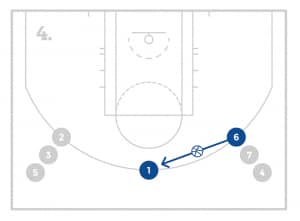 Immediately following the jab, the player will step across their body with the jab foot and take a big step and a big dribble in the opposite forward/angle direction. The player will pick up the ball as if they are shooting after the jab one stride 1-2 stop. From that point, the player will stay there, reset, and repeat the process jabbing again and attacking the middle of the court. The goal is for the player to get inside the 3-point line after 3 of these jabs and take a jump shot after the 3rd jab. The player must take a big stride and cover a lot of ground and be able to explode up into their shot. It is important to do this drill from both directions. Some players may need to start with more than 3 dribbles Don’t allow players to hop onto 2 feet after the dribble. Always have them 1-2 step. Teach the players to play between both players without over committing to one or the other. Often adding foot fakes at the ball helps keep the offensive players off balance. 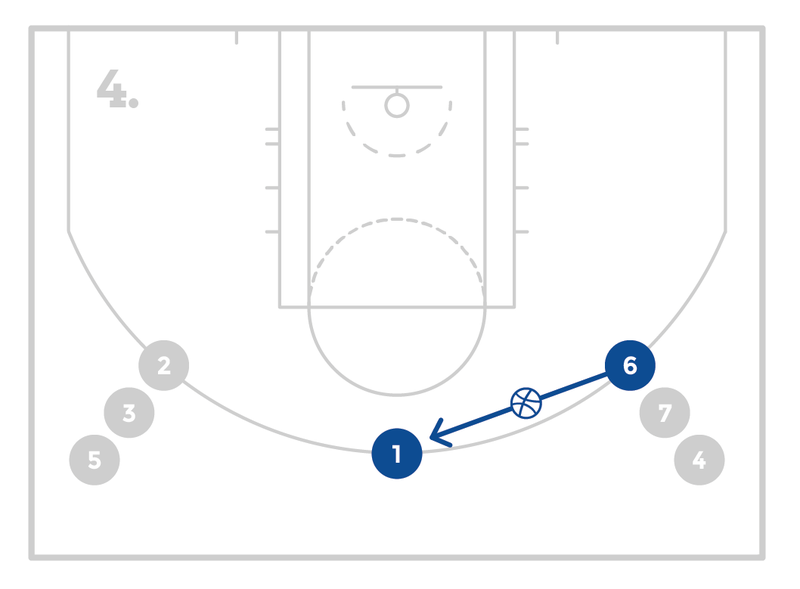 Put the players in one line starting at the free throw line with the first 2 players having a ball. The first player will shoot, if they make it, they will pass the ball to the next person and go to the back of the line. 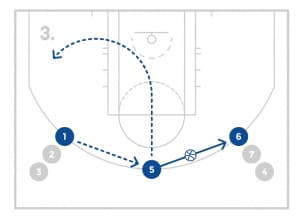 If they miss, they will rebound and shoot from anywhere until they make a shot and then give the ball to the next person and go to the back of the line. If the player shooting behind any player makes their shot before you, you’re out. This teaches the players that every shot is important and the consequence of missing a shot is potentially getting knocked out of the game. Players will shoot under pressure and compete to win.